Want more greens in your life? 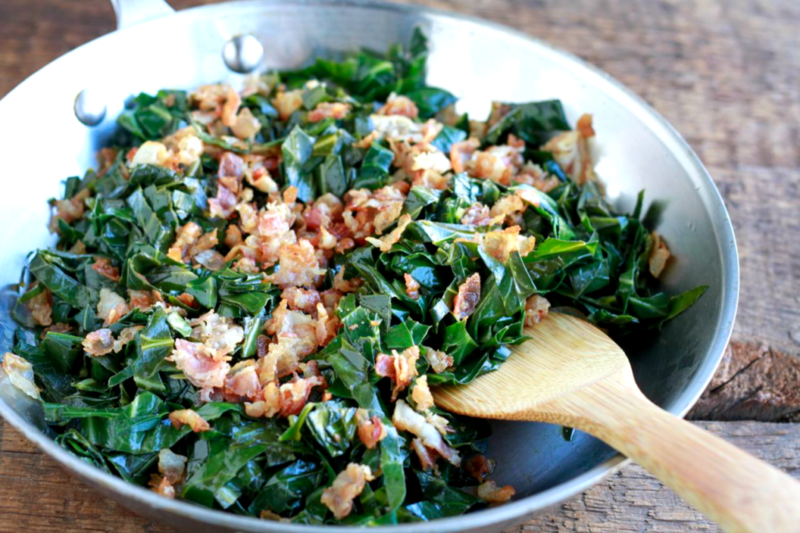 This Savory Greens with Pancetta dish is just the thing. Healthy eating doesn’t have to be complicated. Around here, we keep it super simple. I don’t have time to spend hours in the kitchen every day preparing food for my family. Here’s what I do: I focus on proteins and vegetables. We are lucky to live in an area where good quality, properly-sourced meats are readily available. I stock up on grass fed and pastured meats in my freezer, and most evenings, I just pull out a little something to defrost for the next day. And since we get a weekly box from out local CSA, we have lots of fresh produce to choose from. My favorite time of day to meal prep is is the morning. I will often prepare out protein/meat dish right after I finish breakfast. A few of our family favorites are Chipotle Bacon Sliders, Lemon Rosemary Chicken Thighs, Pesto Meatballs, and Cilantro Lime Steak Strips. I don’t know about you but 430-5pm is a very hard time for me to get anything done. My little one is started to get tired. She wants my full attention. But since I already have the main part of our meal prepared, all I have to do is add the veggies. This system just works for me. Here’s one of my favorite vegetable side dishes. 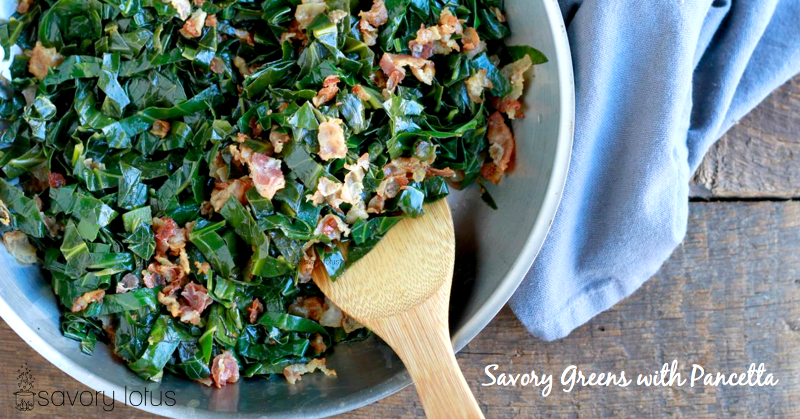 I try to get greens into my diet every day, and this recipe is an easy way to do that. 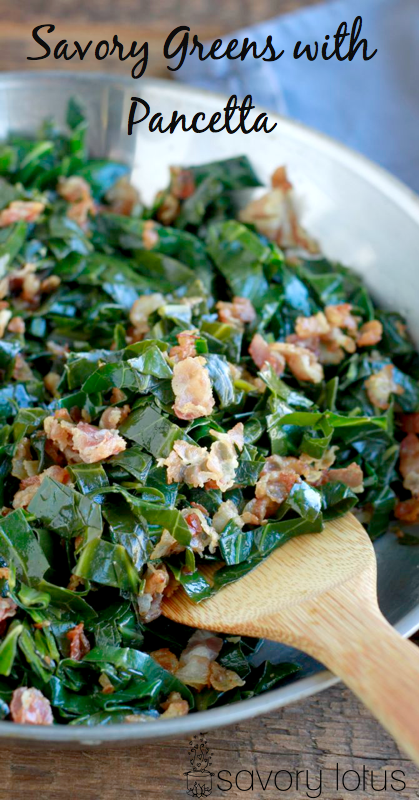 I use either kale or collard greens. They are my favorite. And who doesn’t love a little pancetta? If you don’t have pancetta on hand, bacon will work as well. 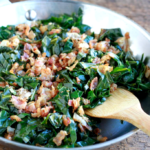 Your family will devour this healthy, and hearty side dish, I promise! Prepare greens by folding leaves in half and slicing away the stem. Then stack leaves, roll into a tight cigar-looking tube and slice in thin ribbons. Set aside. Heat a skillet on medium heat and cook pancetta until browned. Toss is garlic and cook for another minute. Remove from pan and drain on a paper towel. Place greens into skillet and add bone broth and vinegar. Cook, covered, over medium heat until desire doneness – about 10-12 minutes – stirring a couple of times. Add salt and pepper to taste. Top with cooked pancetta. Enjoy! Greens are notorious for being hard to clean. I wash my greens by immersing them in a large bowl of water in the sink several times to remove the grit.